59 Tomahawk missiles were launched from US Navy warships, an official said. US President Donald Trump said on Thursday he ordered missile strikes against a Syrian airfield from which a deadly chemical weapons attack was launched, declaring he acted in America's "national security interest" against Syrian President Bashar al-Assad. US officials said the military fired dozens of cruise missiles against the airbase controlled by Assad's forces in response to the poison gas attack on Tuesday in a rebel-held area. Facing his biggest foreign policy crisis since taking office in January, Trump took the toughest direct US action yet in Syria's six-year-old civil war, raising the risk of confrontation with Russia and Iran, Assad's two main military backers. "Years of previous attempts at changing Assad's behavior have all failed and failed very dramatically," Trump said from his resort in Mar-a-Lago where he was attending a summit with Chinese President Xi Jinping. Some 59 Tomahawk missiles were launched from US Navy warships, the USS Porter and USS Ross, in the eastern Mediterranean Sea, striking multiple targets - including the airstrip, aircraft and fuel stations - on the Shayrat Air Base, the officials said, speaking on condition of anonymity. Damage estimates from the strikes, which were conducted at 8:45 pm EDT (0045 GMT on Friday), were not immediately known. 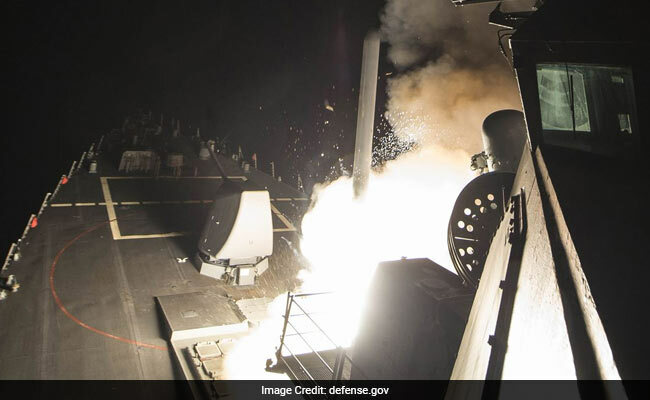 Syrian state TV said that "American aggression" had targeted a Syrian military base with "a number of missiles and cited a Syrian military source as saying the strike had "led to losses." Trump said: "Tonight I ordered a targeted military strike on the airfield in Syria from where the chemical attack was launched. "It is in the vital national security interest of the United States to prevent and deter the spread and use of deadly chemical weapons," Trump said. "There can be no dispute that Syria used banned chemical weapons, violated its obligations under the chemical weapons convention and ignored the urging of the UN Security Council," he added. Trump appeared to have opted for measured and targeted air attacks instead of a full-blown assault on Assad's forces and installations. The relatively quick response to the chemical attack came as Trump faced a growing list of global problems, from North Korea to China to Iran and ISIS, and may have been intended to send a message to friends and foes alike of his resolve to use military force if deemed necessary. Trump said earlier on Thursday that "something should happen" with Assad but did not specifically call for his ouster. US military action put the new president at odds with Russia, which has air and ground forces in Syria after intervening there on Assad's side in 2015 and turning the tide against mostly Sunni Muslim rebel groups. The risks have grown worse since 2013, when Barack Obama, Trump's predecessor, considered and then rejected ordering a cruise missile strike in response to the use of chemical weapons by Assad's loyalists. Only last week, US Ambassador to the United Nations Nikki Haley said the U.S. diplomatic policy on Syria for now was no longer focused on making Assad leave power, one of Obama's aims. Speaking just before the strikes were announced, Russia's deputy UN envoy, Vladimir Safronkov, warned of "negative consequences" if the United States went ahead with military action, saying the blame would be "on shoulders of those who initiated such doubtful and tragic enterprise." Obama's set a "red line" in 2012 against Assad's use of chemical weapons. When Obama then threatened military action after a 2013 chemical attack, Trump issued a series of tweets opposing the idea, including "Do NOT attack Syria, fix U.S.A."
Obama backtracked on the air strikes, and after the latest attack, Trump was quick to blame his Democratic predecessor for "weakness and irresolution" that emboldened Assad.